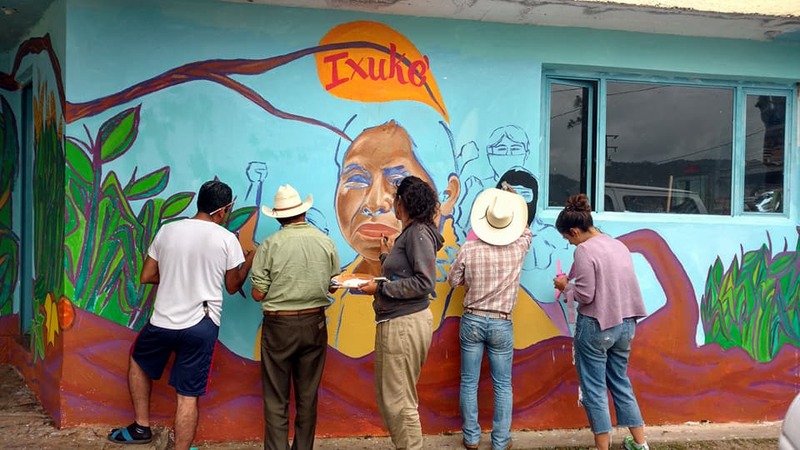 Zapatista school mural jointly painted by Zapatistas and a Schools for Chiapas delegation in 2018 features the image of Marichui, spokesperson of the Indigenous Governing Counsel (CIG). 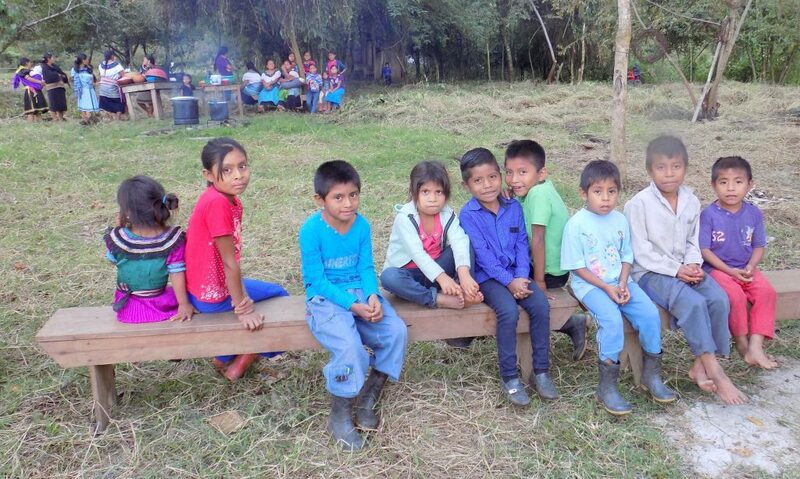 This year has seen amazing advances in the autonomous Mayan schools and communities of Chiapas, Mexico ~ and because of your support, Schools for Chiapas continues to contribute to the steady advances of the Zapatista movement. Students wait in front of their old school as their community gathers to dedicate a new school funded by Schools for Chiapas. Click any photo to help. During 2018 we were very busy! Schools for Chiapas funded the construction of two new autonomous schools, organized an international delegation which painted a massive mural at another Zapatista school, sponsored three intensive Food Forest workshop with Zapatista educators and students, and helped fund the construction of a women’s kitchen at the massive new Zapatista educational center which hosted a 10,000 woman-strong encounter during March 2018. Please pledge today! Click any photo! 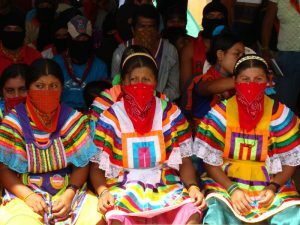 Women moved to the center of the Zapatista agenda with massive gatherings, increased participation, and strengthening of cooperatives. Volunteer interns have greatly expanded our data base of Food Forest plants being used as a textbook at 17 Zapatista middle schools; these same interns have worked with staff and other volunteers to greatly expand the nursery of unique perennial plants being grown for Zapatista ecological agriculture. We’ve continued to support many Zapatista Women’s cooperatives by purchasing thousands of dollars of artesian work, art, coffee, clothing, jewelry, weaving, and other many products now available at our online store. Surprisingly, many cooperative members tell us that the humble purchases made by Schools for Chiapas every year represent a major portion of their annual income. Click here to shop for Zapatista products. Of course 2018 has also seen one demoralizing crisis and racist Trump initiative after another ~ and like everyone we’ve often found ourselves upset and stressed. YES! 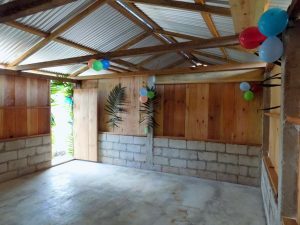 to hand-built walls of love and hope for education! NO! to Trump’s walls of hate. Our goal in 2019 is to construct three schools! Can you pledge today? This strong youngster has found the best place to view the dedication of her new community-built school! However despite these horrible attacks against humanity and the planet, 2018 has offered opportunities for networking and exchange among new and old friends and allies including artists and activists, farmers and workers, teachers and students. As people-of-conscience mobilize and organize, folks are learning about the Zapatista movement and remembering the 25 years of challenging international solidarity work accomplished by Schools for Chiapas. Food forests are growing and expanding at Zapatista schools because of your support. 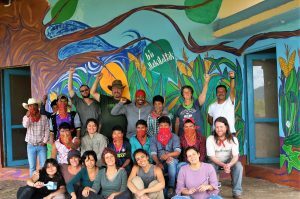 Thank you so much to everyone who is creating new local, national, and international networks of resistance; thank you so much to everyone who has purchased Zapatista products or volunteered with us in Chiapas; and especially thank you so much to the many new donors and monthly sustainers this year. Schools for Chiapas has seen a substantial increase in donations and sales during 2018; and we sincerely hope that this trend will continue in 2019! 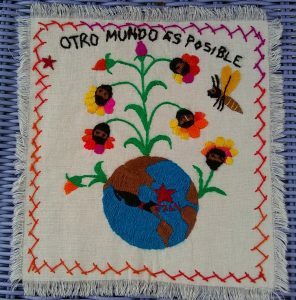 This Zapatista embroidered art piece declares that “Another world is possible” – an often echoed Zapatista belief. Art like this and much more is available in our online store. We hope that you will choose to continue and increase your support today; we see such enormous need and opportunity on the ground in Chiapas. Women and young people are standing up and charting new and creative directions. 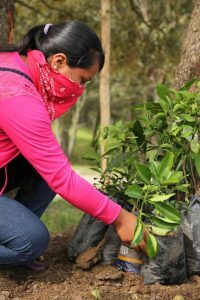 The Zapatista health and education system are rapidly expanding their influence and sophistication with a new generation of volunteer Zapatista promotors. At a national and international level, the National Indigenous Congress (CNI), the Indigenous Council of Governance (CIG), and Zapatista movement are jointly inspiring creative resistances. Most importantly, as temperatures rise, storms increase, and the hateful walls of capitalism threaten; people everywhere are finally standing up and demanding dignity, democracy, and justice. Visiting Chiapas to live and learn in a Mayan community while helping to paint a Zapatista school is an adventure not to be missed! 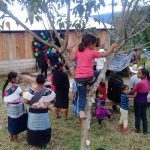 We hope that you will support the construction of three new Zapatista schools in 2019; that you will provide resources for providing unique plants to Zapatista schools from the Schools for Chiapas Food Forest nursery; that you will join us next year in the misty mountains and steamy jungles of the Mexican southeast, and that you’ll give Gifts of Change and Zapatista-made products to your friends and families during your own special holidays. Thank you so much for everything that you do to make the world a better place and please keep in touch! We welcome your participation and we deeply value your input ~ please feel free to email or to contact me via Facebook or WhatsApp. Click here to support our work. Ps. Sometimes we jokingly say that our “Gifts of Change” are a way to give gifts to someone who doesn’t really need more stuff; because Gifts of Change are a way to donate to a Zapatista cause (eg. Schools, Music, Food forests, Women’s programs, etc.) in someone’s name. With every Gift of Change we’ll gladly send along a beautiful, personalized certificate in your name. Someone you love, would love a gift supporting the Zapatistas…please consider this option for your gift giving this year. Buy a Gift of Change here! 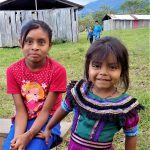 Your donations do so much for indigenous Mayan children like these in Chiapas, Mexico – thank you for your continued and generous support! Donate Now!